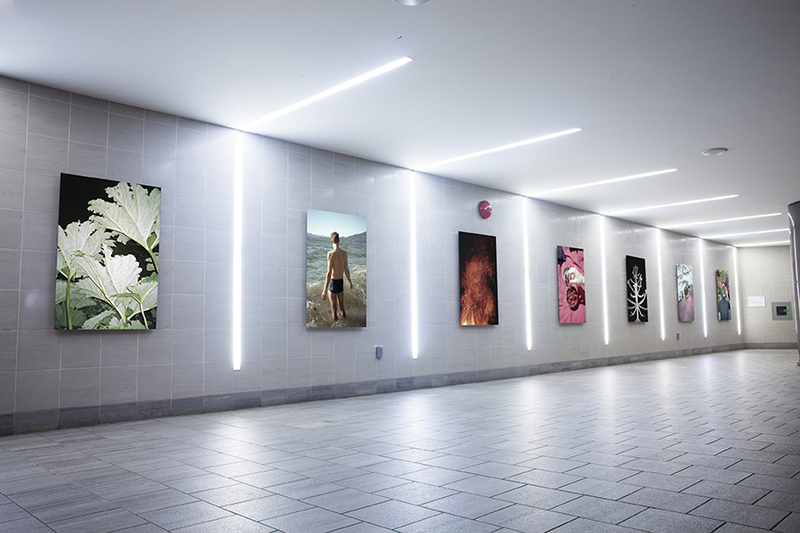 Tom Hsu’s series of seven photographs capture momentary fragments of summer for commuters rushing through the barren corridor of the Canada Line hallway at Waterfront Station. His intimately cropped imagery of flesh, flora, and fire provoke memories or fantasies of mid-summer wanderings. They produce responses engaging subconscious desires. With a close look, one can visualize the sensation of cold ocean water hitting bare legs or the heat of cinders exploding in a bonfire. Through visual means, Hsu’s work produces sensory experience. The images, all shot on a 35 mm camera, present fragments of moments. Each is an experience stilled and cropped. Whether a midnight foray into the forest or a hot day at the beach, each photograph opens up to endless possible experiences of place. Our city, Vancouver, is an unacknowledged participant throughout the series, always there in the background. Or is it rather our experience of place that imprints the expanded frame of Third Beach or East Van onto these images? Hsu’s work holds a kinship with that of photographers such as Fred Herzog, Robert Frank, and Wolfgang Tillmans. With camera in hand, Hsu is a purposeful wanderer. He documents life around him with an eye for compositions that launch the mundane or ordinary into the wild and electric. Subjects are approached from odd angles, cropping out the larger scene to focus on specific forms. Many viewers have commented on the intimacy his work engenders. There is a playfulness and sensuality born of the physical connections among photographer and subject. The title, An urge to propose forbidden thoughts and playing with fire, is a provocation to engage with risk and uncertainty. Tom Hsu is a studio-based visual artist whose works seeks to investigate the absence of the human condition within empty spaces, as communicated through the photography of the everyday mundane. He currently lives and works in Vancouver and holds a BFA in Photography from Emily Carr University of Art + Design. He undertook a residency at Burrard Arts Foundation from April to June 2017. He has exhibited at Unit/Pitt, Index Gallery, and Sweetpup Studio, in Vancouver.